Tweets, facebook posts and blog posts can be powerfull things. The have the ability to sway peoples opinions of others, to drive people to buy software, to sell stock, and to make bad decissions. Posting cranky posts just to get clicks views and retweets does nothing useful but show that all you care about is showing that you want to stir the pot. There are lots of ways of being constructive without fanning the flames. In the above tweet the author just craps all over someone, I assume the people who made the service pack, with no context or any followup at all. I get that it’s only a tweet with 140 characters, but there’s ways to get context. In our next example we see exactly how. 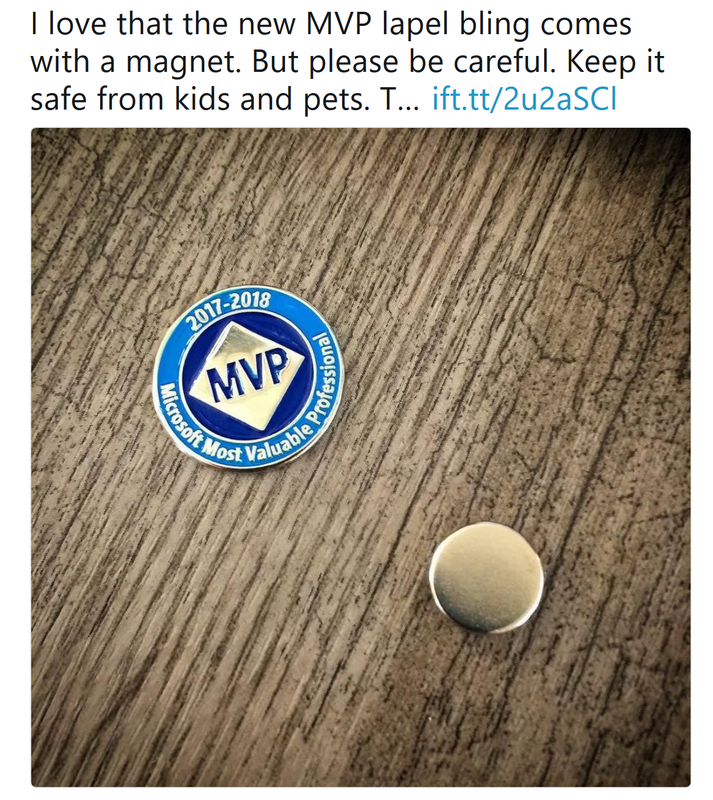 We have a thank you to Microsoft for the lovely lapel pin/magnet, but a warning to people who aren’t used handling rare earth magnets that they need to be kept away from kids. As it’s a longer post (from Instagram) there’s a link though to the origional where the rest of the post finishes with “These are dangerous.”. The warning is still given, but without just crapping all over the fact that somone went through the trouble of sending these out to the MVPs. I think my message here is, think before you post. Think how it’s going to impact others. Not just those you want to have read it, but those who did the thing that you’re writing about. Maybe rephrase how you’re going to post that snarky post and it’ll have more of the desired impact. I can almost guarantee that the first tweet had no useful impact on the SQL Server product team, where as the second post would have had much more impact to the MVP team when designing the next round of awards. The post Being critical without being a crank appeared first on SQL Server with Mr. Denny.